On Jan. 14, 2005, NASA-ESA's Huygens probe successfully descended through the atmosphere of Titan, Saturn's largest moon, after a seven-year journey through the Solar System on board the Cassini spacecraft. The probe was designed to gather data for a few hours in the atmosphere, and possibly a short time at the surface. It continued to send data for about 90 minutes after touchdown. It remains the most distant landing of any human-made craft. At the landing site there were indications of pebbles of water ice scattered over an orange surface, the majority of which is covered by a thin haze of methane. 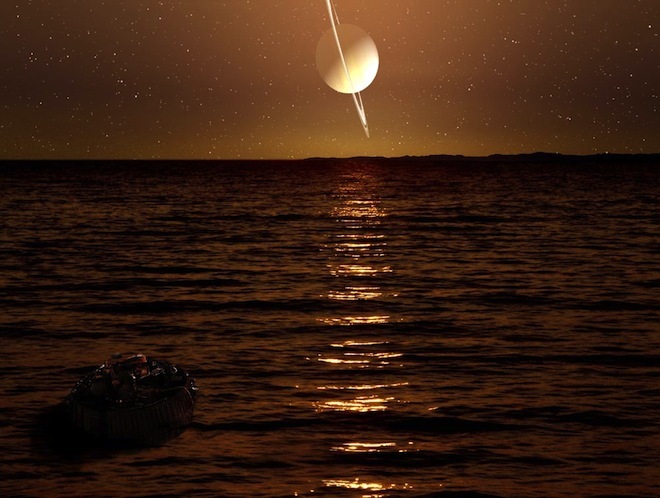 Early aerial imaging of Titan from Huygens was consistent with the presence of large bodies of liquid on the surface. Ha ha ha ha ha ha ha ha ha! !......If you think this is real there is no hope for you.